None of the women sitting in front of James Hartrick on a recent morning in Detroit look like kitchen amateurs, but he takes nothing for granted. He’s here to show them how to make barley jambalaya, and he starts with the basics: Food safety. Hand washing. How to handle a knife. He asks if anyone in the group has food allergies or sensitivities. And then he gets to work dicing onions and green peppers. This is Cooking Matters, a class aimed at low-income families, though open to all, to teach healthy food preparation, shopping and meal planning. Nutrition and budgeting classes such as these are increasingly important in Michigan as residents face increased poverty, hunger and obesity. Some of Michigan’s low-income families have seen their food budgets shrink because Michigan’s tough stance on federal food assistance has led to reductions in such programs in recent years. Nutrition programs help fill the gap – offering low-income families help that goes beyond giving away food giveaways to help them budget and eat better. In 2014, 75 percent of Cooking Matters participants said the classes improved their nutrition practices and between 42 and 73 percent of participants (from children to seniors) reported eating more fruits and vegetables, according to Michigan State University Extension, which administers the program. Hartrick’s class is a special edition for diabetics. Eleven participants, all African-American women, have gathered in a west-side community center to watch how he puts together this Cajun-influenced, low-fat, nutrient-balanced dish. They will leave with the recipe, the ingredients to reproduce it at home and the hope that it will perhaps inspire a change in how they prepare and consume meals. Like a recipe, the class proceeds in steps; a little technique, a little education, a little audience participation. Members of the class share their reasons for being here today. “I have to get my (blood) sugar down. Walking’s not helping,” one says. The smell of frying onion and pepper begins to waft through the room as the discussion turns to carbs and fats. Michigan gets $23.7 million in federal funds to educate low-income residents on healthy eating habits, the second-highest amount allocated to any state. Noting the encouraging outcomes of nutritional education, experts say more can and should be done to make sure proven nutrition programs reach more people in need. The U.S. Census reported in September that one-in-six Michigan residents lives in poverty. Even so, some low-income residents receive less federal food assistance than in the past due to the state’s tough stance on public benefits. Michigan is one of 14 states that have an asset test for families enrolled in the Supplemental Nutrition Assistance Program (SNAP), formerly known as the food stamp program. In Michigan, anyone with savings over $5,000 cannot get federal food assistance, regardless of income. And last year Michigan was one of only four states that chose to not invest in the federal “heat and eat” program, which offers more food benefits to poor families in northern states to offset higher heating costs, which would’ve cost the state $18 million. As a result, about 169,000 Michigan households enrolled in SNAP saw their federal food assistance reduced by an average of 15 percent, or $76 per month, according to the Michigan Department of Health and Human Services data. The state’s food insecurity rate also is about 15 percent, which means about one in six residents lack the funds to provide a reliable source of healthy food. And yet, paradoxically, Michigan also is getting heavier – 30 percent of adults were classified as obese in 2014, up from 22 percent in 2000 and 13 percent in 1990, according to “The State of Obesity,” funded by the Robert Wood Johnson Foundation. Cheap food is often filling but not healthy, so many impoverished families end up overweight, said Dawn Contreras, director of the Health and Nutrition Institute at the Michigan State University Extension. MSU Extension gets $7.5 million in federal SNAP Education funds to teach low-income residents how to improve their nutrition. MSU reached 84,000 people statewide last year and funds Cooking Matters classes taught outside the Detroit metro area (classes within the five-county metro-Detroit area are administered by Gleaners Community Food Bank) among other programs. Cooking Matters is a national program dating from the early ‘90s ‒ a spinoff of the national hunger-relief program Share Our Strength, now known as No Kid Hungry. The cooking program came when organizers realized putting food into people’s hands was only half the battle, said Sarah Mills, program manager for Cooking Matters in Detroit. “We can raise awareness and money to get food, but if people don’t know how to cook, it won’t be used,” said Mills. As lower-income people are likely to have complex or irregular work schedules and other challenges to a healthy lifestyle, Cooking Matters classes emphasize smart shopping and meal planning, so meals can be served even in difficult conditions. In addition to surveys showing participants adopting healthier eating habits, the Cooking Matters program is slowing showing itself to be scalable: More than 5,000 people took Cooking Matters courses statewide in 2014, up from fewer than 1,000 in the program’s first year, in 2009. Families interested in better nutrition must sign up for programs like Cooking Matters, it is not required in order to receive federal food benefits. But as low-income people look for ways to stretch food dollars, it and other programs are part of the solution. Double Up Food Bucks, for instance, allows SNAP recipients to double their food assistance dollars if they use the money to buy Michigan-grown fruits and vegetables at farmers markets and select grocery stores. It is a result of the the Local Food for Healthy Families Act, a federal law passed last year that provides five years of funding for food incentive programs. Participants have their EBT cards debited and receive twice the amount in tokens to spend at markets. The sharp-eyed can even find fresh food growing from the ground, if they care to learn plant identification on vacant lots, hedgerows and other green spaces. This past summer Laura Casaletto sat at a table at farmer’s market in a school parking lot in Grand Rapids next to a bucket of flowers and greens she plucked from public areas around town. Daisies, lamb’s quarters, St. John’s wort are all edible or good for making tea. She also had a bowl of stir fried, orange day lily buds that tasted buttery, salty and a little slippery, not unlike okra. She and a plant-smart 5-year-old led a tour around Gerald Ford K-8 Academy for a class on foraging edible wild plants. In about 15 minutes the school grounds and a neighbor’s side yard yielded wild grape leaves, milkweed, plantain, oyster plant, wild tomatillo, mulberries, garlic mustard, wild lettuce, lamb’s quarters and a bunch of flowers. Offered by Our Kitchen Table, a nonprofit, the foraging class teaches low-income Grand Rapids-area residents another way to put good food on the table, a method that costs no more than the effort to gather the plants. The classes started in 2013 with seven curious students, and has since served 157 people. Casaletto said there’s no such thing as weeds, because people can eat plenty of so-called weeds in salads once they learn to identify the good stuff. 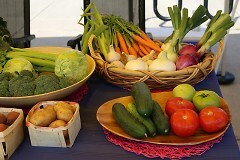 Most Americans are now dependent on a business, a grocer or farm stand to tell them what plants or vegetables to eat. It took only a generation or two for a majority of Americans to go from growing their own food to being unable to tell the difference between a pepper and a poison. One way to expand the reach of proven nutrition programs could be to offer them to a captive audience – school kids, said Sara Gold, director of Michigan No Kid Hungry, a Share Our Strength initiative supported by United Way for Southeastern Michigan. Young people in vulnerable communities could be reached by adding nutrition education programs to school curriculums, or by tying nutrition lessons into federally-funded school meal programs, Gold said. But it has to be all carrot, no stick. “Federal regulations would not allow the state to mandate nutrition education classes,” said Bob Wheaton, spokesman for the Michigan Department of Health and Human Services. Cooking Matters and the foraging workshop maximizes and supplements SNAP benefits, but need remains high for the 1.5 million people – as of May – who still receive food assistance in Michigan. Michigan’s asset test prevents some low-income Michigan residents from getting food assistance. Those who have a second car worth $15,000 or have savings of more than $5,000 have to choose between those savings and government assistance for food. They can’t have both. The state defends its approach to food assistance eligibility, saying the effort is meant to protect U.S. taxpayers by providing federal food dollars to only the poorest of the poor in Michigan. Through MSU Extension, “Cooking Matters” is funded in part by SNAP Education funds but also with other grants and private donations. The diversity of funding sources means the workshops can be open to people who are – or are not – eligible for federal food assistance. Back in the Detroit Cooking Matters class, participant Gayle Pettiford, 74, says she has been working to improve her diet and live a healthier lifestyle since she was diagnosed with Type II diabetes nine years ago. “I take my sugar reading every morning,” Pettiford said. “On a good day, it’s around 109 to 115. On a day when I cheat, it might be 143. Once a month I’ll have a breakfast splurge on breakfast, sausage and eggs. Otherwise I eat oatmeal. Equity is produced by the Institute for Global Education (IGE), 1118 Wealthy St. SE in Grand Rapids. IGE supports the nonviolent resolution to conflicts and the pursuit justice as the best way to achieve true, lasting peace through conscientious individual and group education and action. You can read the September issue of Equity here. The Southeast Area Farmer’s Market, run by Our Kitchen Table, sells locally-cultivated produce and goods in the southeast community of Grand Rapids. It aims to foster social justice, with the market as just one area in which that mission is lived out. Blending groceries with a cause, the Southeast Area Farmer’s Market brings together local vendors and produce to help make natural food more accessible to the area. Located at Garfield Park (2111 Madison SE) on Fridays and the Gerald R. Ford Academic Center (851 Madison Ave SE)on Saturdays during the summer, the market is currently managed by Our Kitchen Table (OKT), a grassroots nonprofit organization that works with the communities of Grand Rapids to sustain healthy living and social justice. The market started out as a collaboration between the Greater Grand Rapids Food Systems Council and the Kent County Health Department 11 years ago. Since then, the main management of the market has shifted to OKT, but the goal remains the same. Most of the food sold at the market comes from urban farms within the area, none of which is out of season, according to Christina Flier, the market manager for OKT. Flier, along with other members of her community, helps out at the Thomas Street Community Garden in the Baxter neighborhood, which in turn sells its produce to the market. Though smaller in size, the market offers a range of products, from vegetables and fruits to spices and tea leaves. The type of food and the vendors change weekly, so each week offers a slightly different selection than the last. Roscoe Price, an 87-year-old vendor, sells cherries, peaches and corn as well as J.R. Watkinsproducts. He’s sold the Watkins products alone for more than 30 years. Another vendor and member of OKT, Laura Casaletto, sells foraged materials, such as different grasses, leaves and berries, for use as tea ingredients. To her, great food can be easy to find if one knows just for what and where to look. Casaletto teaches foraging classes and engages in other projects with OKT, like the extension of bike lanes and planting of fruit trees in parks, to help educate and improve the community. The market emphasizes the people of southeast Grand Rapids, but it has drawn in and welcomes people from outside the area, too. Laura Casaletto, OKT’s urban forester and leader of tonight’s Earth Day Spring Tree Tour, made the WOOD TV 8 news last night. Here’s the video clip. Great job, Laura! On March 8, Slow Food West Michigan awarded OKT a $300 micro-grant for purchasing seeds and supplies for our food gardening programs. The organization also awarded OKT its Snail of Approval, an emblem that recognizes contributions to the quality,authenticity and sustainability of the food supply of the West Michigan region. Slow Food West Michigan is the West Michigan chapter of Slow Food, a non-profit, member-supported organization founded in 1989 to counteract fast food and fast life. It stands against the disappearance of local food traditions and people’s dwindling interest in the food they eat, where it comes from, how it tastes and how our food choices affect the rest of the world. SFWM supports the mission of Slow Food, working closely with Slow Food USA, the national association headquartered in Brooklyn, NY. Slow Food USA envisions a future food system that is based on the principles of high quality and taste, environmental sustainability, and social justice—in essence, a food system that is good, clean and fair. We seek to catalyze a broad cultural shift away from the destructive effects of an industrial food system and fast life; toward the regenerative cultural, social and economic benefits of a sustainable food system, regional food traditions, the pleasures of the table, and a slower and more harmonious rhythm of life. On January 22, OKT executive director Lisa Oliver-King was Coach TMB’s featured guest on the In Life Now blog-radio talk show. Listen to the archived program here.